Hi! My name is Nova. I live in Holland Michigan. I am new to the whole chicken thing. 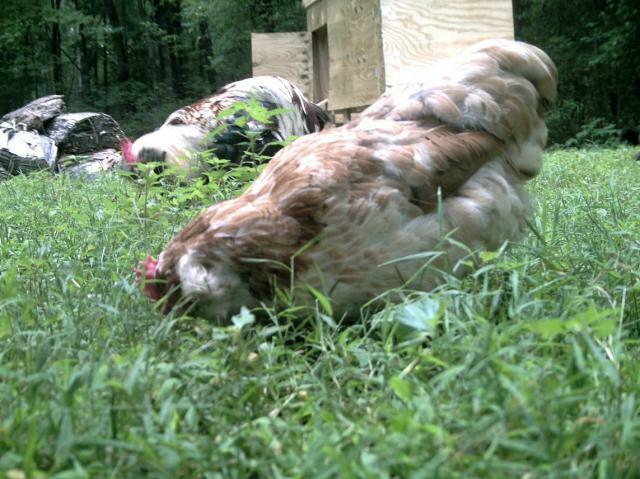 So far, I think I might be addicted to learning everything I can to make my chickens happy. I never knew there were so many breeds. Some are just absolutely gorgeous. 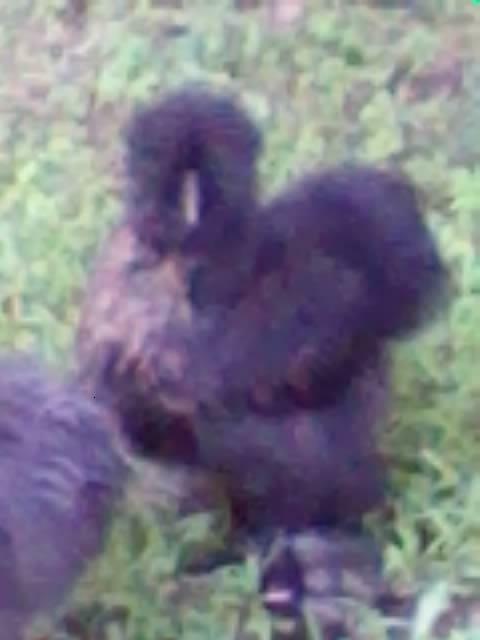 I have currently have 3 Silkies, 2 buff hens and 1 black roo. I have 1 leghorn (she's my fav! 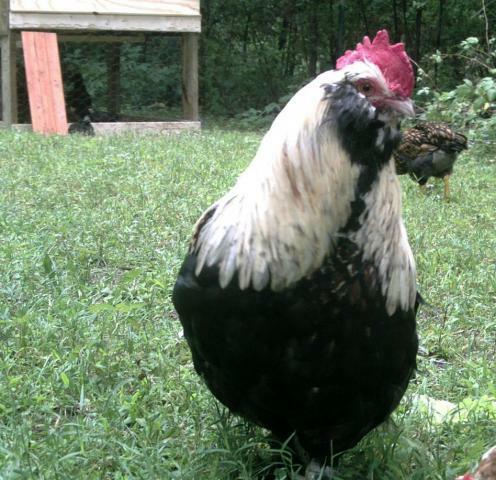 ), 2 gold laced Wyandottes, 1 silver, 3 black Cochin bantams, 1 black Australorp, 1 ProRed, and another one, thats super pretty, but NO CLUE! I think she might be a mix of cochin and something... And a pair of Salmon Faverolles. I also have 2 sons, 6 and 3. 2 dogs, a Boston bully (boston and english bulldog) and a Rotten Puggle. Since the page is under construction, I will post pics soon of my girls. My Faverolle couple, Buffy Petunia and Mr. Fluffers. This is Mr. Fluffers. He's so handsome. Has a lot of blue, green and lavender in his tail and wings... Will try and get a better picture of him later. He's only just learning to trust me. 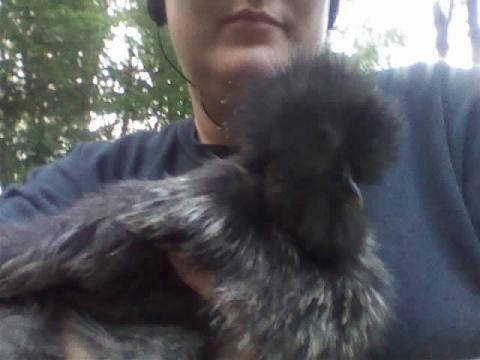 This is Black, he's a black Silkie with silver leakage. He's one heck of a guy. My son is going to show him with the Cloverbud section of 4H in the spring. He's a 5 month old now, and is about 2 pounds. He's got great feathering and his stance is lovely. Almost all his toes are feathered. Phone pic...This is Little Head... He had that name because when we got Him, (maybe her) he had a very small head in comparrison to his body. Now he's feathered out pretty good and is pretty balanced. The partrigde bleeding is starting to become more prominent. Was very light when he came to live here. This is Vanna, she's only 4 months now. 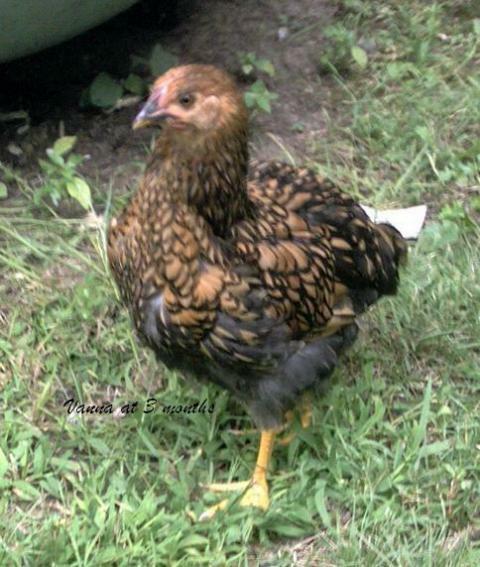 Gold Laced Wyandotte. We also have another gold and a silver. Vonna and Venna. I still have several other girls and a few more roos, but DO NOT have nice pictures of them yet... They do not like to sit still for very long. Ok, they don't sit still at all! But, these are some of my pretty birds. I love my chickens. Great to read up on your flock. I guess it's grown a bit since you wrote this! You have a current thread going?